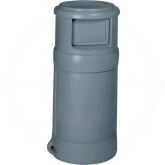 These receptacles have dual self-closing doors to keep debris and odor inside while keeping pests out. The two door design encourages use from multiple points of entry. Removable top allows easy access with no clumsy straps. Factory Mutual approved fire-resistant design contains and extinguishes fires. Optional stainless steel top enables the top to be used as a ash tray. Colors: Beige, Black, Brown or Gray. Weight: 25 lbs. (Ships at a dimensional rate of 78 lbs).